This is a typewritten one page letter written in English, dated January 30, 1941. It was sent by Daniel Mascioli to his father, Leopoldo (Leo) Mascioli. 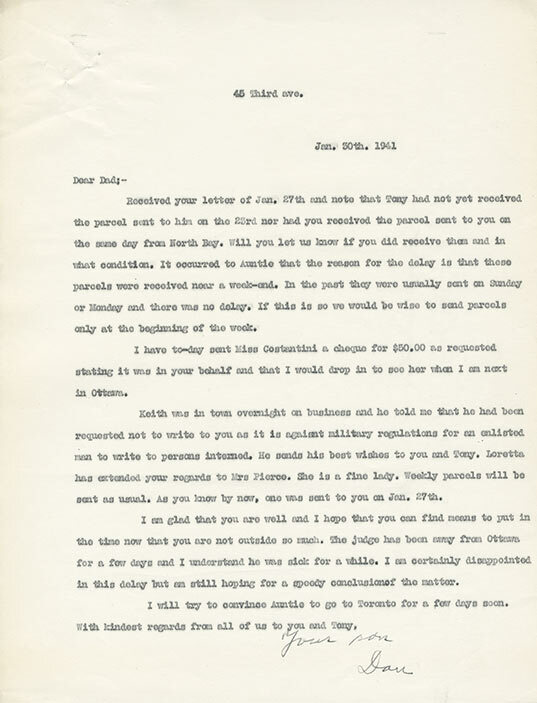 Daniel confirms that he made a cheque out to Ms. Constantini, as requested by Leo in his January 27, 1941 letter. Dan mentions that his brother-in-law, Keith Stirling, was in town overnight on a business trip. Dan informs his father: "he had been requested not to write to you as it is against military regulations for an enlisted man to write to persons interned." Keith Stirling was serving in the Canadian Army fighting overseas, at the same time that Leo and Antonio Mascioli were interned.